Looking for beautiful and bold this season? JustMensRings.com has the low-down on a cutting-edge accessory that can elevate your look for an irresistible price. Our polished tungsten ring with lasered scroll design can complete your daily look or serve as the ultimate wedding band for your wedding. The lasered scroll design is timeless. Curious about tungsten? Our men's polished tungsten ring with lasered scroll design is made from tungsten carbide, a compound of the rare metal tungsten and an equal number of carbon atoms. 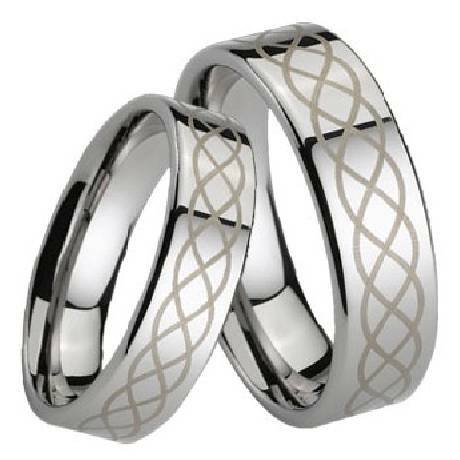 Similar to stainless steel, tungsten is one of the most affordable options for silvery wedding bands. As one of the hardest known substances in the world, tungsten provides superior scratch resistance and will withstand wear and tear. 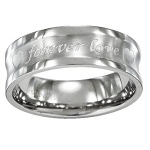 Tungsten jewelry is very affordable compared to precious metals. Modern grooms are pushing past silver, gold, or platinum to wear alternative metals that make a fashion statement. Our men’s polished tungsten ring with lasered scroll design is subtly sophisticated yet comfortable to wear. Using extra metal, we created a slightly domed band to accommodate men with larger knuckles. Comfort fit tungsten rings usually run 1/2 size larger, it is suggested you buy a half size smaller than your standard ring size. We recommend having your finger measured for a comfort fit ring at your local jewelry store for an accurate fit. All of our tungsten rings come with a lifetime warranty. Really a great ring and an unbelievable price ! I've had this ring now for about a month and couldn't be happier. A few months back I lost my wedding ring and wanted to replace it. I found this web site justmensrings.com and took a chance. WOW, was I impressed, I still thinks it's too good to be true, but so far everything has been great. I work a lot with my hands and really scratched up my previous ring so I choose to try Tungston this time. I really like the ring and highly reccomend this site to others to give it try.